16 MMS September 2017 mmsonline.com MARK: MY WORD Commentary We Are Renewing. Will You? Many subscribers who receive the print edition of Modern Machine Shop will find a yellow note tag on the front cover of this September 2017 issue. The note is a friendly reminder to those recipients to please renew their subscriptions (easily done by going to mmsonline.com/subscribe or emailing us at subscribe@mmsonline.com ). For these tagged subscribers, not renewing now will mean that the print edition of MMS will stop being mailed to them each month. There are many good reasons to keep receiv- ing the paper-and-ink version of this magazine. For one, it's a great way to get information, espe- cially the information you didn't know you needed or could use. Paging through a magazine lets you discover what's new—new processes, new products, new suppliers and new users who are sharing their experiences with new processes, new products and new suppliers. These user stories are likely to be rather in-depth studies of how developments and advances in metalwork- ing or shop management are playing out in the real world. This as-lived context makes the some- times complex technical details and theoretical c o n c e pts e a s i e r to g r a s p a n d m o re re a d i l y absorbed. 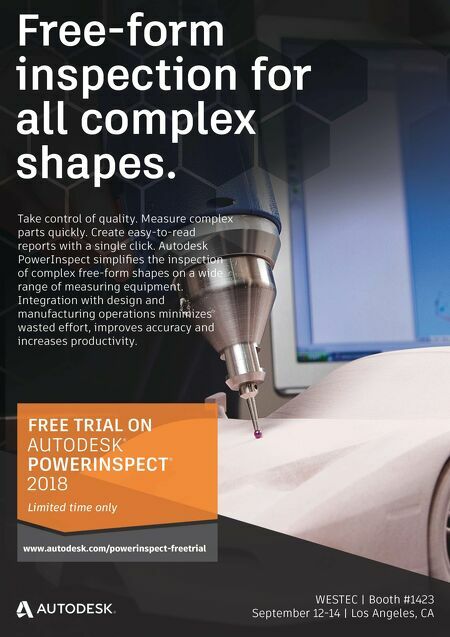 The print experience reinforces this receptive mindset. For another reason, you'll want to see and In print, every word has to count, and we pledge to uphold that responsibility. Now we are counting on our subscribers to make sure they renew on time. enjoy the new, fresh look of this magazine start- ing in Januar y 2018. We are making the "print experience" even more inviting, more readable and more colorful to showcase articles and fea- tures that will also be more timely, more topical and more actionable (full of ideas you can put into practice). We are working hard on this renewal, so we've made subscription renewal hardly any work at all. Plus, 2018 is an "IMTS year," which means that several issues will provide thorough coverage of the International Manufacturing Technology Show, North America's most important technology event next year. Other reasons to resubscribe are worth men- tioning as well. Subscribers get special offers; event discounts; survey result previews; and (if an email address is provided) advance notice of webinars, conferences and other activities. Being a regular reader of our monthly issues also builds a foundation for getting the most from our online and digital resources at mmsonline.com . What you discover in print can easily lead to meaning- ful research and technical exploration in our digital world. So, if you are currently a print subscriber, it's because you qualify according to our guidelines for building the best and most receptive audience for metalworking know-how. In fact, information about our qualified subscribers must be checked and verified for our circulation to be cer tified by an independent auditing agency. We encour- age all subscribers to renew once a year. New- subscriber wannabes are also welcome. It is an honor and a privilege to receive this magazine in print, just as it is an honor and a privilege for us to serve our subscribers. Please honor our request for a timely renewal. 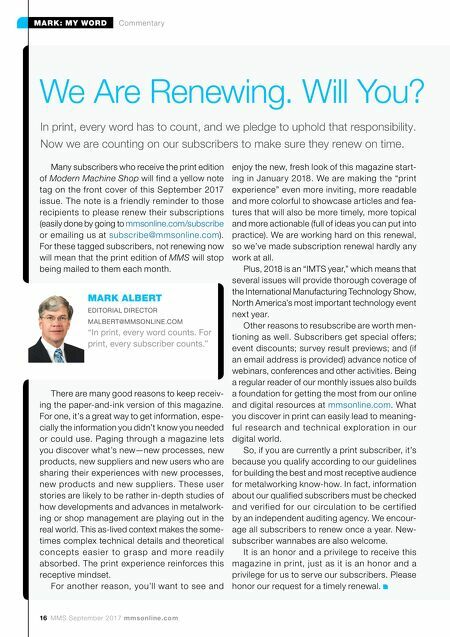 MARK ALBERT EDITORIAL DIRECTOR MALBERT@MMSONLINE.COM "In print, every word counts. For print, every subscriber counts."